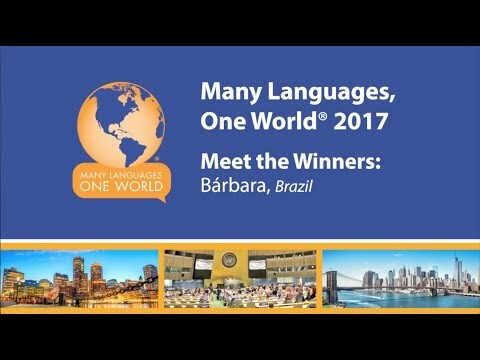 Bárbara Rafaela da Silva Machado is a winner of Many Languages, One World® 2017 and will be attending the Many Languages, One World Global Youth Forum in Boston and New York City! Bárbara is a winner in the English language group and is originally from Brazil. Check out the video to learn more about Bárbara and her upcoming trip to Boston and New York City. To see what Bárbara and the other Many Languages, One World 2017 winners are doing while in Boston and New York, join the conversation on your social media platforms using #MLOW2017! To watch all of the winners present live in the General Assembly of the United Nations, visit: WebTV.UN.org at 10:00 AM EDT on 21 July 2017! The presentations will be streamed live in the six official languages on the United Nations! Watch our Facebook Live at 11:30 A.M. EDT on 22 July 2017 where Bárbara and some of our other winners will speak about their Many Languages, One World experience from the top of the One World Observatory at One World Trade Center! To learn more about Many Languages, One World, click here!